Korbyt is on the GO again with our latest software update. 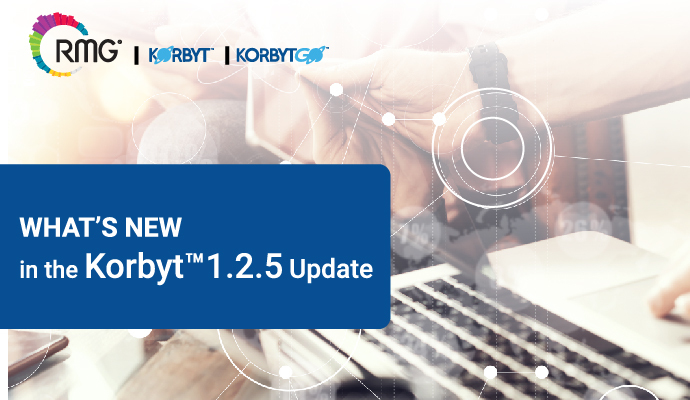 Fast on the heels of our January 1.2 release, Korbyt 1.2.5 introduces a host of new features and enhancements for the digital signage and mobile extensions of Korbyt. This update went live on Monday, March 12, 2018, with no downtime to the Korbyt platform thanks to the hard work of RMG’s research and development team. We are constantly working to improve Korbyt’s offerings. As with all Korbyt updates, the latest release packs in many UI/UX enhancements, new features to meet customer requirements and new strategic features that provide innovation to the platform. The 1.2.5 update introduces some very exciting new features for the mobile extension of the platform, KorbytGO. We’re supercharging employee engagement with a new Gamification feature set! Gamification is a way for administrators to increase employee adoption and use of the mobile app. Internal communicators can now reward employees for being proactive and engaged on the company’s mobile information hub. This new feature rewards employees for participating in surveys and quizzes, sharing content and commenting or liking posts. Administrators can set up point systems and reward tiers that encourage employees to redeem points earned through app participation for tangible rewards. In addition to the new Gamification feature, we've made KorbytGO more scalable for administrators by adding new bulk user provisioning features. From the beginning, KorbytGO has been developed in lock-step with Korbyt. One of the features that sets our software apart from the competition is KorbyGO’s deep integration with digital signage. The new Player Push feature allows administrators to utilize a KorbytGO mini-app (GO-TO) as a content publishing tool for Korbyt powered digital signage. We've added features to Korbyt that make digital signage content creation, content scheduling and network management easier, more scalable and even more enterprise friendly. A massive new Playlist Triggers feature allows Korbyt content administrators to easily use information from real-time data feeds as triggers to make dynamic playlist content changes. Admin users can now easily build content triggers with any Korbyt data integration including time, weather, social media data, keywords in data feeds, business KPIs, call center data, inventory levels, pricing changes, sensor data and more. There is practically no end to the number of devices that need to be integrated for a growing enterprise! For network administrators, we’ve added a new bulk player provisioning feature for more scalability when integrating a large network of devices into Korbyt. A new feature in Korbyt's Layout Interactive Button Element improves usability by allowing content authors to select from the new Quick Actions menu to designate interactive actions and destinations. This requires no coding and makes the interactive creation experience faster and easier for all levels of Korbyt users. The new Media Library feature allows content to automatically expire in Playlists, making content publishing for large networks quicker and easier. These are only a few of the innovative features we’ve added to Korbyt with the 1.2.5 release. To learn about all of the improvements and new features that we’ve added to streamline your visual and employee communications, please reach out to us at info@korbyt.com!